Katrina Miles stood in the attic of the Lewis Latimer House in Flushing last week, sifting through photographs documenting the life of arguably the greatest Black innovator ever. In one picture that Miles held, Latimer was with his fellow officers in the Union Navy during the Civil War. In another, he was standing among the 28 original Edison Pioneers, an elite group that had participated in the early years of the electric light industry. Suddenly, Miles noticed a trend developing. Miles, who officially became the Latimer House’s first executive director two months ago, has two main goals: to raise the house’s profile and collect enough money to open it full-time to the public. 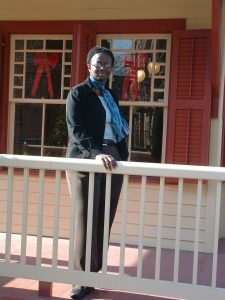 Before coming to Queens, she was the director of marketing and public relations at the John G. Riley House Museum in Tallahassee, Florida. Using the same methods, Miles hopes the Latimer House will someday earn the recognition it deserves. While many of Latimer’s inventions are still used today, most New Yorkers and Queens residents do not know who he was, let alone the fact that he lived in their town. When Miles first came to visit the Latimer House after applying for her current position, she found that almost everyone she encountered had misconceptions about its famous owner. Although Latimer was never a household name, he certainly should be, Miles said. Born to runaway slaves George Latimer and Rebecca Smith in 1848, Lewis Latimer began his post-Civil War career as an office boy for the patent lawyers Crosby and Gould in Boston. After eleven years of watching other workers draw inventions, he was finally named head draftsman. In 1874, Latimer helped patent a device to improve the quality of bathrooms on trains, and two years later he assisted Alexander Graham Bell in patenting the telephone. But Latimer’s most famous achievement came in 1881, when he invented a process to manufacture affordable, long-lasting carbon light bulb filaments. His techniques brought electricity to cities such as New York, Philadelphia, Montreal and London, and they remain the basis of contemporary electric lighting. Since Latimer’s carbon filament had an international effect, Miles believes the house should be promoted to tourists across the globe. Actually, in the late 1980’s, the prospects for saving Latimer’s Queen Anne-style home seemed dim. Originally located at 137-53 Holly Ave., the house had fallen into disrepair and was going to be torn down to build an apartment complex. But former Queens Borough President Claire Shulman and former City Comptroller Harrison Goldin helped relocate the building to its current address at the corner of Leavitt and 137th streets. The house that Latimer had lived in for 20 years was saved, and renovations began in 1999. Miles is not the only one who thinks Latimer’s story has the power to inspire the Black community. Winifred Norman, Lewis Latimer’s 90-year-old granddaughter, has spent most of her life promoting his inventions. Miles already has plans for Latimer’s home if she can raise enough funds. She would like the house, which is now only open by appointment and for a few hours on Thursdays, to be open six days a week with a full staff to give tours. If possible, she someday hopes to hold a Science Olympics for students in the neighboring field. Norman, who remembers playing in the house with her brother, thinks Miles is the perfect person to publicize the house. Lewis Latimer helped give light to the world. Now Katrina Miles hopes to shed light on him.